The art of change ringing is peculiar to the English, and, like most English peculiarities, unintelligible to the rest of the world. To the musical Belgian, for example, it appears that the proper thing to do with a carefully tuned ring of bells is to play a tune upon it. But to the English campanologist … the proper use of the bells is to work out mathematical permutations and combinations. In 1900, eight bells in the key of E were cast for the Church of the Advent at the Whitechapel Bellfoundry in London through the gift of Robert Codman in memory of his wife, Catherine. At their dedication on October 7th, 1900 they “were pronounced to be of remarkable richness, dignity and mellowness of tone.” These marvelous bells, the lightest 666 pounds and the heaviest more than 2100 pounds, are still rung every week by the Advent Guild of Bellringers in the style known as English Change Ringing. What is English Change Ringing? “English Change Ringing” refers to the rhythmic sounding of a set of tuned bells in changing sequences that are determined by the mathematical principles of permutation. These sequences do not resemble either the tunes typically played on a carillon or the jangle of European style church bell ringing but instead are the majestic pealing that is associated with great English state ceremonies as well as humble village weddings. From the 12th century, the chiming of tower bells had been customary in all English villages to tell the time of day and to call people to church services. Ringing changes on these bells first arose around the year 1600 in the eastern counties of England, having been made possible by two parallel developments. The motivating development was the desire for the bells to be heard more broadly over the countryside and for the ringers to have more control over the timing of the sound. The enabling development was the replacement of the rope and lever, which had been used from the earliest days to sound the bells with, first, quarter wheels and then, by stages, the full-circle wheels we still use today. The bells could then be rung by means of a rope running in a channel around the wheel’s rim down into the room below where it was pulled by ringer using a long, vertical, two-stroke movement. This arrangement allowed the bell to swing through 360 degrees and to sound just before it reached the balance, mouth-up, projecting its voice widely up and out of the tower. In just this same manner are change ringing bells hung and rung to this day. 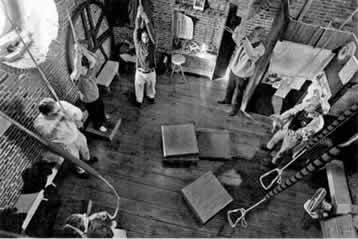 In the ringing room, directly below the belfry, ringers stand in a circle, one behind each rope. The person ringing the lightest bell calls out the traditional alert: “Look to!” Then as she starts her pull, “Treble’s going!,” and finally as the bell begins to swing downward, “She’s gone!” Each other bell is then pulled off in rapid succession creating the mesmerizing sound of a descending scale, repeated over and over again, known as “Rounds.” The ringer who has been designated the conductor will soon announce the method to be rung by calling out, for example, “Go, Grandsire Triples,” and smoothly – if all goes well – the sequence of sounds will change from the descending scale to continually shifting orders while keeping to the steady, even rhythm. The Patterns: Those changes in the order of the bells’ sounding that constitute a method are governed by four rules: (a) no bell may move more than one position at each change/row; (b) each bell sounds once in each row; (c) no row is repeated; and (d) the ringing begins and ends in Rounds. So, in the first row the bells ring in order 123456, then in the next row, for example, adjacent pairs of bells might all switch positions and the order would become 214365. In the next row, the bells in the first and last positions might remain in place and all the others might switch producing the new order: 241635. Such switching would continue until the bells came back into Rounds. The diagram to the left shows the simplest of the methods, Plain Hunt on four bells, with a line drawn through the path – that is, the sequence of moves forward and backward in the order – that is followed by Bell #2. Since eight bells can be rung in 40,320 different orders, enormous variety in the methods is possible. Ringers commit various methods to memory and shift within or among them according to directions from their conductor. The methods are collected in books – every tower has a copy of “Diagrams” and most ringers carry a copy of “The Ringing World Diary,” and, more importantly in this era of rapid development, virtually all methods are now available on-line through several different electronic archives. These archives, supported by the growing library of books and electronic tutorials about how to learn to ring, provide an invaluable resource for the study that is essential to making progress as a ringer. ringing on tower bells. Once the smooth, straight pull (shown in the photo at right) that guides the rope most efficiently in its path has been fully mastered, even small people can ring very large bells. Making a bell sound earlier or later in any given row, however, requires further refinement of rope handling skills. The small adjustments to the pull that are necessary to change the position of a bell in the row are accomplished by each ringer’s altering the position of her hands on the rope, the exact timing of the pull itself, and the energy applied. For all the bells to be sounded exactly where and when they should be requires very close teamwork among all the ringers in the band. Since a bell sounds about ¾ of a second after the ringer has initiated the pull, achieving correct “striking” requires the development of reliable internal rhythm, fine attunement to the actual sound of the bells, and the ability to interpret the visible movement of all the ropes in the circle. Development of these essential skills for basic bell control typically takes some months for learners and achieving true mastery is a lifelong endeavor for most ringers. The Language: One of the pleasures of change ringing is the rich language that ringers use to communicate with each other about what they are doing. Our bells are fitted with gudgeons and sliders, and our ropes with sallies and tails. The basic moves in our methods are dodging, hunting, and making places, while more complicated maneuvers have names like cat’s ears, bus tickets, and fish tails. In following the blue line we lead, lie behind, and take [another ringer] off the front. While ringing some methods we might be in the slow, or doing Long London, or being quick bell. When the conductor makes a call, we may run in, run out, or make the Bob. When our striking is poor, we may be admonished to keep the backstrokes up, or to widen the handstroke gap, and if we fail to do this, the touch may fire up. When the ringing is good, we can enjoy listening to the roll-ups or the tenors coursing. Most perfectly, our methods are classified as Plain, Surprise, or Delight! Change ringers are often attracted to “The Exercise,” as it was called in earlier times, because of the unusual sound or the mathematical nature of its music as well as the antiquity of the art. They typically continue to ring because of their pleasure in the powerful combination of mental discipline, physical skill, and close teamwork that is required for it all to “work.” Added to that are the benefits of the relations among local and regional ringers and their participation in the wider international ringing community as well as, for parishioners, an opportunity to support their church in a practical and pleasurable way. English Change Ringing is still generally practiced only in parts of the world that once constituted the British Empire. In England today about 40,000 ringers serve nearly 5000 towers, while on this side of the Atlantic more than 500 members of the North American Guild of Change Ringers ring in 45 towers. Similar numbers of ringers and towers are active in Australia and New Zealand and a much smaller number in South Africa. A weekly magazine, The Ringing World, is published in England to keep members of the worldwide community in touch with interesting developments, achievements, and milestones, while numerous web-sites and services form important linkages to both historical and current information. 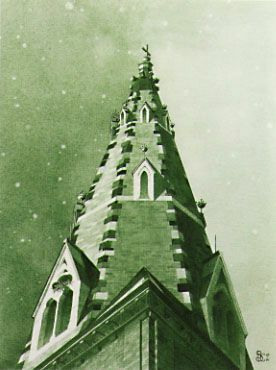 After the Advent bells were dedicated, they were rung for only two or three years before they were silenced because of complaints about the noise. They hung unused in the belfry for 70 years until in 1972 Geoff Davies and Doug Brown rediscovered them and taught a band to ring them again in the English Change Ringing style. 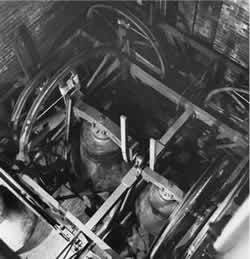 The bells had suffered from their long neglect, however, so in 1976 they were rehung in a new frame, somewhat lower in the tower, and with better sound controls. Their “go” was thus significantly improved and ringing at the Advent began to flourish. On July 4th, 1976, the Advent bells first joined the Boston Pops in performing Tchaikovsky’s 1812 Overture for a national television broadcast, beginning an annual tradition that continues to this day. The local band has been through many changes in the ensuing decades and for about ten years starting in the 1980s became the most active band in North America. They rang a record number of peals (three hours of continuous ringing), including some of such complexity that they have never been rung anywhere else, and also developed a network of friendships throughout the ringing world that still brings ringing visitors to the Advent regularly. Today the band is building again. We continue to include and welcome people of all ages, genders, occupations, personal styles, and beliefs. 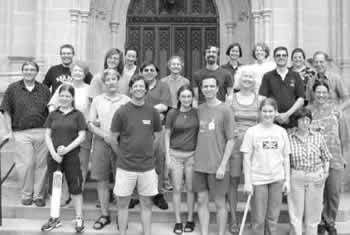 We ring peals and quarters regularly, travel to other New England towers (the photo shows the band after ringing at the Groton School), and hold various events throughout the year to introduce more people to the great art of change ringing. The band rings for Sunday services from 10:10 to 11:05 AM at the Advent and from Noon to 1:00 PM at Old North. Learners are expected to participate in regular service ringing once they have become independent and reliable in Rounds. On Wednesdays we meet at the Advent Parish House door at 30 Brimmer Street until 7 PM, when that door is locked. Anyone arriving later should go to the door around the corner on Mt. Vernon Street and, when the bells are not sounding, ring the white buzzer located on the left-hand frame of the right-hand pair of doors. Be sure to hold it down for two seconds and someone will come down to let you in. On Sundays we enter the Advent through the Mt. Vernon Street door and then turn left immediately and go up to the tower through the library. There are many sources of information about English Change Ringing on the web including an overview of change ringing in Boston at http://bellringers.scripts.mit.edu/www/change-ringing/in-new-england and the North American Guild of Change Ringers’ page at http://www.nagcr.org/.